Elegant Findings Antiques is known worldwide as a favorite Boston antique store that has an extensive selection of antique porcelain and stemware, as well as rare antiques, furniture, linens and silver. Our goal is to provide a shopping place where you can find those one of a kind rare antiques that you have been looking for, but couldn’t find anywhere else. Elegant Findings Antiques is a favorite Boston antique store for the past twenty six years, and has been serving customers from all over the world. ElegantFindingsAntiques.com marketplace has a wonderful selection of Antique China. For twenty six years, Elegant Findings Antiques has been a popular Boston antique store specializing in fine china. We search for antique porcelain that you can’t find anywhere else. Our love for beautiful hand painted china has led us to search far and wide to find our rare and beautiful selection of antique porcelain from around the world. At this time, we would like to invite you to join us to shop at our online antique store, which has a fabulous selection of antique porcelain. Each piece of china has been hand picked carefully for its individual beauty, detail and its great condition. You can use our crystal stemware and glass: Baccarat, Hawkes, Webb, Moser, Lalique and Venetian to make your table more spectacular. 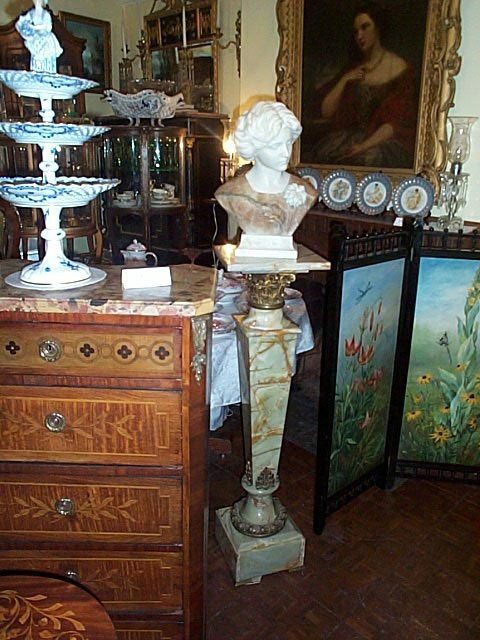 Our customers love our one of a kind pieces of antique furniture: curio cabinets, marble top credenzas, tables and chairs, along with our decorative antiques like lamps, mirrors, clocks, fans, paintings and sculpture.